New York : W. W. Norton & Co., c2011. A branding consultant explains how to craft miniature messages such as headlines, titles, sound bites, brand names, domain names, and slogans that grab attention, communicate effectively, and stick in the mind, focusing each chapter on a particular tool. Implicit in "Microstyle" is the faith that you can say a lot in relatively few words, imply even more and broaden the effect still further by immersing the reader in the depths of connotation and feeling. 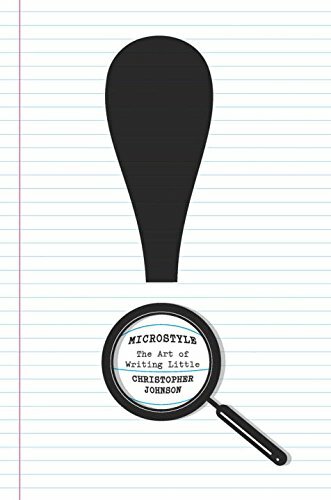 Christopher Johnson’s lively first book, “Microstyle: The Art of Writing Little,” is a work of pop linguistics that doesn’t have much that’s blindingly new to say. That is, it synthesizes a wide range of current thinking from recent books about grammar, branding, cognitive science and Web theory. But it does so with intelligence and friendly wit. Very interesting and quick read. How to get yourself heard quickly and effectively - be personal, be brief, be interesting, be relevant. This is a must read for people interested in language, and of course, writers.